Please refer to our stock # 2921/01 when inquiring. 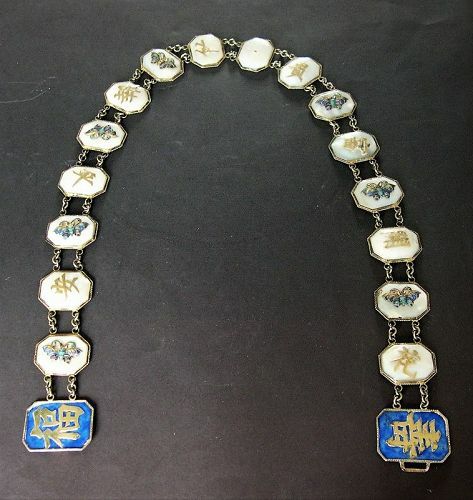 A Chinese lady's belt made of 16 mother of pearl discs each mounted with alternate appliques of butterfly and auspicious Chinese characters. One of the two end gilt silver clasps which are decorated with enamel characters is stamped "90" followed by characters. The quality of the multicolor enamel work as seen in the butterflies, is superb. size: 70 cm long. age: C. 1900. condition: One butterfly is missing and one disc has part of the Chinese character missing.